Fraser Clyne from Aberdeen was one of the very best marathon and long distance runners Scotland has produced with representative honours and championship medals on the road, on the track and over the country. He travelled the world as did many of his contemporaries in search of good races – perhaps more than most – with a penchant for excellent racing in the Unites States where he was second in their national marathon championship in Sacramento in 1985. A real student of the event his historical and statistical knowledge is said by those who know him to be vast. “He is basically”, says his friend Colin Youngson, “a serious focused guy who has been known to laugh. His appetite for horribly hard training is legendary. This was one determined, ambitious, tough athlete (with long relentless legs!) who deserved every single success and ended up much better than a few equally or more talented runners. He occupied the position in Aberdeen AAC which Allister Hutton occupied in Edinburgh Southern Harriers – simply the best on very nearly every team occasion.” Given the feats achieved by this obviously intelligent athlete one has to wonder why Scottish Athletics has not sought to use some of his knowledge and experience in any capacity/ Given the dire state of the event at present he would certainly have something very useful to say! 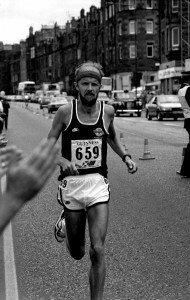 Unlike some of his contemporaries who never raced a Scottish Marathon Championship he won it on no fewer than five occasions with a record equalling three in a row. The wins were in 1992, ’92’, ’94, ’96, ’97 and to add to the statistics, he was inside 2:20 for the distance no fewer than 22 times. From Oakland and Sacramento in the States to Fukuoka (Japan) and Melbourne (Australia) he carried the Scottish flag and brought credit to the country. His best time of 2:11:50 is still fifth on the Scottish all time list (well, fourth as far as I am concerned – the four ahead of him include Paul Evans!) This page will be completed gradually because of the amount of information to be amassed so we will start with his replies to the Scottish Marathon Club Questionnaire as published in the June 1985 issue. How did you get involved in the sport? I started running in my second year at Aberdeen University (winter of 1974/75). Until then I played football in the local amateur leagues but I got tired of being kicked off the park every week so I decided to try athletics. I got a great deal of encouragement from people such as Tony Millard, Steve Taylor and Ron Maughan who were in the University Hare and Hounds team at that time. The first race that I competed in was the Edinburgh to Glasgow Road Relay! I had only been running a matter of weeks but I was given the fifth leg to do. It was a disastrous performance, the team actually finishing in last place! Nevertheless I wasn’t discouraged and in December of 1975 I decided to broaden my athletic horizons and joined Aberdeen AAC. This was an important move as I was soon introduced to Mel Edwards who has been a valuable source of encouragement and advice throughout the past decade. What exactly do you get out of the sport? In my career to date I have been a member of three clubs – Aberdeen University, Aberdeen AAC and Glasgow University – and at each one I have enjoyed the social side of the sport as much as the competitive element. I have great memories of Aberdeen University’s annual tour of Ireland, particularly the occasion when Steve Taylor asked for a bottle of sweet stout in a Galway bar – he was offered a pint of Guinness and told that if it wasn’t sweet enough he could add sugar! Obviously in recent years I have had tremendous opportunities to travel throughout the world because of my running and that has been a tremendous bonus for me. I have been to most European countries, the USA and Japan and as a result I have made good friends in these places. Probably the best thing of all however is being able to go down to the club on a Wednesday evening and do a hard 10 with the rest of the guys then retire to the pub for the rest of the evening. What do you consider your best performance? Obviously my second place at the US Marathon Championships in Sacramento in a pb of 2:11:50 stands out as my most satisfying performance to date. But I got equal pleasure in finishing sixth in the national junior cross country championship in 1976 when Aberdeen AAC won the team award. Winning the Scottish Universities cross country title in 1979 was also a highlight as were my two wins in the Oakland Marathon (1983 and 1984). And your worst? There are a few to choose from but probably the worst moment I had was finishing last in my international track debut in the 3000m steeplechase at Crystal Palace in 1980. I wasn’t just last I was 100 yards behind the next closest finisher. It was awful. What do you do to relax? I don’t have much free time but when I do I like to listen to some good music – Bob Seger, Eagles, Don Henley, Supertramp, Toto, Reo Speedwagon, etc. What goals do you have that are still unachieved? My main ambition at the moment is to gain selection for the 1986 Commonwealth Games in Edinburgh. If I succeed in making the team I would then aim to do as well as humanly possible at the Games themselves. However if things don’t work out there will always be new targets to be met. Running always gives you something new to aim at regardless of the level of competition you are involved in. I would like to do some more road racing in the United States if I have the time. The atmosphere at American races is tremendous and the weather is generally more conducive to fast running than here in Scotland. I also have ambitions in the cross country season. I have run for Scotland in four World Cross Championships (1981-84) but I would like to gain selection for this competition on at least another three occasions to take me past Alastair Wood’s Aberdeen club record of six appearances in the event! I have twice taken third place in the Scottish Cross Country Championships and that is something else that I would like to improve on. Can you give details of your training? During the build up to a major marathon I run around 90-100 miles per week. Generally this is made up of a long run on a Sunday (20-22 miles) and a series of steady runs during the week which vary in distance from 5 to 10 miles. If I don’t have a weekend I do three ‘work sessions’ between Monday and Friday. Normally these take the form of hill repeats, mile reps and 300m reps although sometimes I will do a series of 1200m reps or 800m reps. The training programme remains constant throughout the year. In the final seven weeks before a big marathon I cut back my mileage quite drastically (to around 30 miles) to ensure that I’m as fresh as possible for the race. This was written in 1985 and already he is talking about international vests on the track and over the country and his second place in Sacramento etc. And he wasn’t nearly finished: he still had to win his first SAAA Marathon Championship. And as far as passing Alastair’s record in the World Championships is concerned then he just failed to do so – mainly because of an act of Fate! He ran in the World Cross in 1981, 1982, 1983, 1984 and 1986 and then the rules were altered and Britain was required to enter a single British team instead of the four home nations entering separate squads. This has a really serious effect on Scottish Cross Country running – and I suppose on Welsh and Irish as well since the bulk of the population, the nature of selection and the actual selectors tend to massively favour England. He did not have the opportunity to emulate his illustrious fellow Aberdonian. At this point there was a real congregation of distance running talent in the North East and as a part-illustration of this I mention the coverage of his victories in the East District Cross Country Championships – in the 1981 race Colin Shields reports that “Fraser Clyne just outsprinted Youngson for the title“, and the same reporter on the 1982 East District Championship said “Clyne and [Graham] Laing outclassed their opponents to such an extent that they linked hands in a staged dead heat.” However the race referee who didn’t like dead heats awarded it to Laing. There is an interesting article by Fraser himself on the SATS Website at www.scotstats.com where in the Blog section he writes about “My Favourite Race”. You have to go right to the bottom of the page but the article is well worth the effort. aFraser is also journalist who writes about athletics for Aberdeen papers and magazines and along with club mate Colin Youngson, Fraser wrote a history of the Scottish Marathon championship under the title ‘A Hardy Race’. Just click on the title for access to it.